In 2006, she released her debut single “Tim McGraw”, then her self-titled debut album, which was subsequently certified multi-platinum by the Recording Industry Association of America. In November 2008, Swift released her second album, Fearless. Fearless and Taylor Swift finished 2008 at number-three and number-six respectively, with sales of 2.1 and 1.5 million. Fearless has topped the Billboard 200 in 11 non-consecutive weeks; no album has spent more time at No. 1 since 2000. Swift was named Artist of the Year by Billboard Magazine in 2009. Fearless won the Grammy Award for Album of the Year in 2010. Her third album, Speak Now was released in November 2010. In 2008, her albums sold a combined four million copies, making her the best-selling musician of the year in the United States, according to Nielsen SoundScan. Forbes ranked Swift 2009’s 69th-most powerful celebrity with earnings of $18 million. In January 2010 Nielsen SoundScan lists Swift as the top-selling digital artist in music history with over 24.3 million digital tracks sold. To date, she has sold over 20 million albums worldwide. 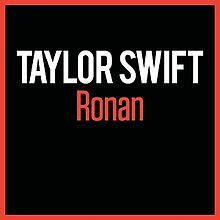 “Ronan” is a charity single released on September 8, 2012 by American country pop artist Taylor Swift to iTunes Stores. Swift wrote the single based on a blog she read of a four year old boy who had died from cancer. Swift wrote the song, with co-writing credit going to Maya Thompson, the mother of the boy. Swift first performed the song live for Stand Up to Cancer in September 2012, and all proceeds of the single go to help fight cancer. The title of the song is the boy’s name, Ronan. Rónán is an Irish language male given name meaning “little seal” (Rón meaning “seal”, and -án being a diminutive suffix).